Dental implants are long-lasting, reliable, successful solutions to replace damaged or missing teeth and restore optimal oral health. 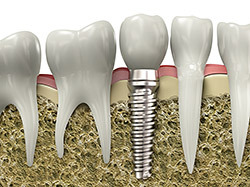 An implant is made of a screw that acts as a synthetic root which is positioned in the bone. A crown is attached to the screw and becomes the portion of the tooth above the gum line. The best part about dental implants? They’re almost indistinguishable from the rest of your natural teeth. Drs. Jamison and Davis have provided patients throughout Lilburn and Alpharetta with beautiful, natural-looking dental implants for several years. Our experience and dedication to your comfort makes Polish Dental Center a great place to restore the function and beauty of your smile. 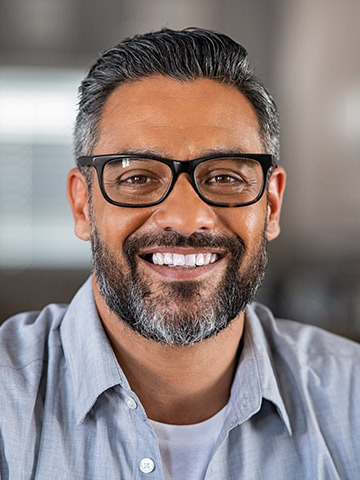 Dental Implants, Bridges, or Dentures: Which is right for you? A bridge is a permanent prosthesis that is attached to the surrounding natural teeth. They usually require the removal of healthy tooth structure to make room for the bridge attachment. Dentures can be full or partial, but they are prosthetic teeth with a false gum line that can be placed in and out of the mouth. Because they are removable, dentures rarely feel like natural teeth and can make eating and speaking challenging. 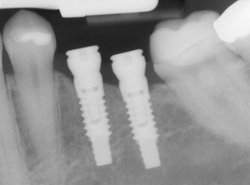 Dental implants have become the gold standard of tooth replacement. Not only do they look like natural teeth, but they do not require the support of neighboring teeth for stability. Because the implant is placed directly into the bone, they feel and act more like normal teeth, with a strong biting force. Consider your dental implants to be the same as natural teeth. They require the same daily brushing and flossing, and the same amount of regular checkups and cleanings at our Lilburn dental office. Just like your natural teeth, the better you take care of your implants, the longer they will last. Take the first step to enhancing your self-confidence, self-image and oral health by contacting our office today to schedule an appointment.